Thomas Jefferson stands alongside Madison as the one of the strongest voices in America for Religious Freedom. 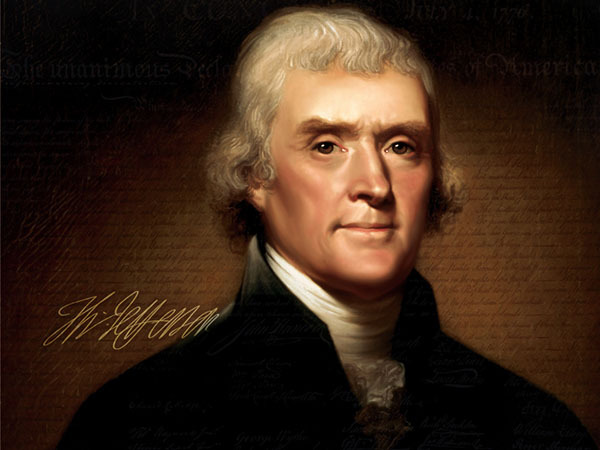 Much has been said about Thomas Jefferson’s view of religion and the state, and many attempts at distorting his writings and his background have been used by those who would claim that his thinking actually supported a religiously friendly government. These attempts are generally, if not universally fueled by todays fundimentalist Christians in order to support the idea that the United States is by design, a Christian Nation. Current presidential nominee, Republican Senator John McCain, has stated that “I would probably have to say yes, that the Constitution established the United States of America as a Christian nation,” However, those claims fail to stand up to any scrutiny in light of the volume of statements to the contrary. An examination of the constitution shows no mention of Christianity at all. Jefferson may have been one of the most non-religious presidents in our history. He was viewed at the time as an atheist. Although deeply spiritual, his spirituality found no home that was attached to dogmatic belief. Little is known about Jefferson’s spiritual beliefs.He rarely spoke of them in anything other then expansive Deistic views. “Say nothing of my religion,” Jefferson once said. “It is known to myself and my God alone. Its evidence before the world is to be sought in my life; if that has been honest and dutiful to society, the religion which has regulated it cannot be a bad one.”As a student at William and Mary, he studied under William Small who had vast knowledge of the Scottish Enlightenment and it’s highly integrated approach to law, history, philosophy and science. It was an education that informed everything that stands out to us today when looking at who Jefferson was and what it was that shaped his world view.